On some level, we all want to be significant. We want to feel valued which in and of itself, there’s nothing wrong with that as long as we don't pursue it or live it out in an unhealthy way. With this, we can often struggle with feeling insignificant or unworthy, and more. You may struggle with feeling insignificant at times as well. You are not alone...the world is full of people searching for significance and struggling with the very same things. Unfortunately, some confuse significance with fame or popularity which it is not. They identify their worth by what they do or accomplish. In addition, some want to seek fame …the next viral video or YouTube. Some feed on how many “likes” or followers they receive on social media platforms like Facebook or Instagram. Some will also try to bring you down and make you feel that you aren’t important, worthy or worth something…but as for you...hold onto God's truth and don't believe the lies spoken to you or that you speak to yourself! You have to shift your focus off these temporal things to God's eternal Word and specifically what He says about you and how He defines you! You are significant… No matter what, I want you to know here and now that in Christ, The One Who gave you life in the first place and defines you…He says you are significant! So much so that He took up the cross for you so that you might be forgiven and have salvation in Him. He loved you that much! Please note that NONE of these passages say anything about God operating without a specific purpose in regard to you nor do we see here that you have no worth or significance! ...Quite to the contrary…Again…You became worthy and significant through Christ! You may feel insignificant at times but you can choose to live significantly by living the way God has commanded you to live! God the Father sees you and says…There’s my child whom I love with a sacrificial, perfect and eternal love whom I sacrificed my Son Jesus for! 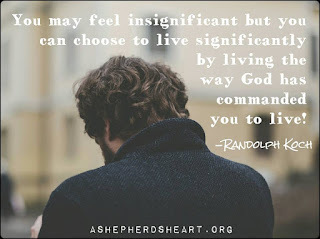 Choose to live significantly for Him my friend because you are secure, accepted and significant in Christ! Don't ever forget your worth! God gives you significance...so live it out!